The bands are open! Make time to listen. Though I’ve spent the entire day sawing and splitting firewood, I’ve been actively recording spectrum on the 31, 25, 19 and 16 meter bands with the WinRadio Excalibur, Elad FDM-S2 and the SDRplay RSP. Why? Propagation–especially on the higher bands–has been the best it’s been in several weeks. As I discovered at the recent SWLing Post DXpedition, my shack PC can handle making multiple spectrum recordings simultaneously as long as I limit each recording to the width of a broadcast band. (I’ve never tried pushing the limit very hard.) Someday in the future–perhaps when we’re having terrible propagation–I’ll play those spectrum recordings back and tune through them as if they were live. Radio time travel at its best. When I decided to throw in the towel with all of the firewood processing, I fired up the Sony ICF-SW100 (above) and tuned in a game on 17,855 kHz: Radio Exterior de España. The REE signal was simply booming into eastern North America! Hard to break away from the radio on days like this. My advice? Take advantage of these conditions and make time to listen! For me, SWLing a great excuse to relax and let me back heal after a long day of splitting wood. For some, perhaps it’s a good excuse to take the radio outdoors and away from urban interference. Whatever the excuse, don’t hesitate to fire up your radio! There are some interesting stations on the bands this evening. Feel free to comment with some you’ve logged. 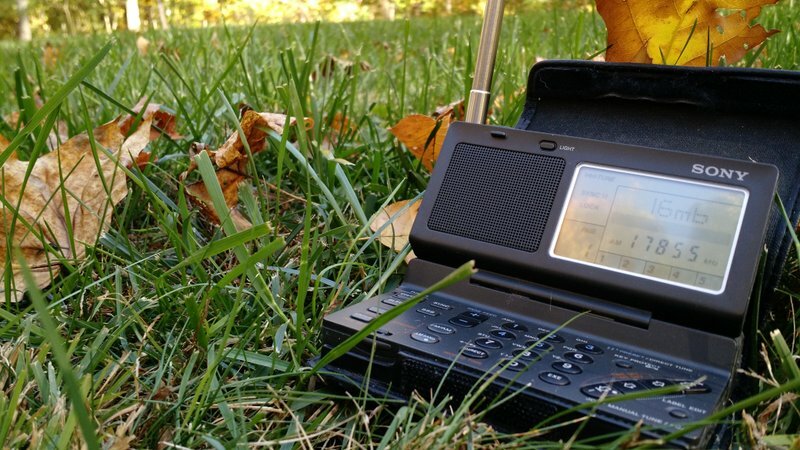 This entry was posted in News, Radios, Shortwave Radio, What's On Shortwave and tagged Propagation, shortwave, Sony ICF-SW100, SWLing on October 17, 2015 by Thomas. 17855 coming in SUPER strong, wow. UTC 21:24 in NYC. Some very good loggings, Thomas. Well with the cooler weather, a harbinger of fall and winter, the bands should be getting better for listening. It is time for us to retire to the solitude of the shack, fire up the rig, don the headset, and spin the dials hi hi. Listening to baseball game DX on 1520 khz right now. Will try SW later on. Afedri SDR and Wellbrook ALA-100M up in a tree. Also UNID on 11570 kHz: lots of music and good signal. Maybe Radio Free Chosun? These are the good times when the bands are really nice to cruise….thanks. And nice SW100! It’s a welcome event when propagation is favorable! Hope you’re catching some good DX, Dan!